In her essay “Video Remains: Nostalgia, Technology and Queer Archive Activism,” Alexandra Juhasz discusses the importance of “queer archive activism” in preserving the lives of queer folks. Speaking in reference to her own documentary Video Remains, Juhasz explains, “It is not our suffering that is compelling but our willingness to name and record it, and in so doing, make communal and move into the present” (328). The role of the personal archive as a supplement and challenge to the silences and erasure in dominant history is certainly nothing new. As Ann Cvetkovich notes in her much-quoted (at least here on Filthy Dreams) introduction to An Archive of Feelings, “In absence of institutionalized documentation or in opposition to official histories, memory becomes a valuable historical resource, and ephemeral and personal collections of objects stand alongside the documents of the dominant culture in order to offer alternative modes of knowledge” (8). 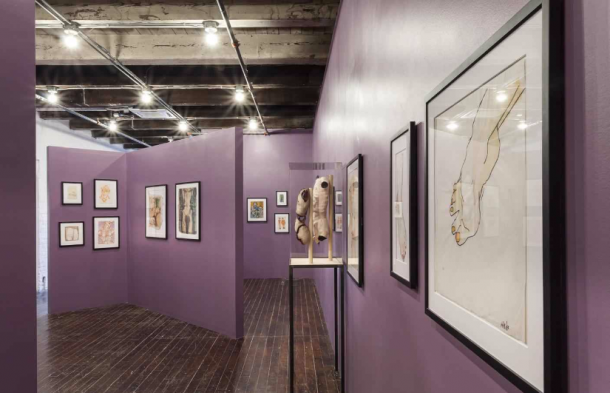 It’s with this in mind that the current installation of A Selection from the Greer Lankton Archive of the Mattress Factory at Pittsburgh’s Mattress Factory becomes so significant–not only as an opportunity for insight into a still under-recognized artist, but also as a record of trans experiences. Located above a floor of James Turrell light installations and next to a Yayoi Kusama infinity room (not one of Kusama’s later playgrounds for the selfie-obsessed, but still), the selection from Greer Lankton’s archive, one of several new installations on view in honor of the museum’s 40th anniversary, very literally inserts itself into dominant (read: blue chip) culture, as Cvetkovich describes. Donated to the museum in July 2014, the archive, in total, includes, according to the wall text, “thousands of items” such as “drawings, paintings, sculptures, sketchbooks, photographs, correspondence, personal journals, press clippings and more.” The first installment of hopefully many, A Selection from the Greer Lankton Archive of the Mattress Factory focuses mostly on Lankton’s works on paper, as well as several vitrines full of flyers, datebooks, photographs and other ephemeral materials. Installed right outside Lankton’s final installation It’s All About ME, Not You, part of the Mattress Factory’s permanent collection since 1996, the selections from Lankton’s archives connect with this longtime installation, as well as shed more light on Lankton herself. An artist often connected to the heavily romanticized East Village scene, Lankton’s life and work has been largely underappreciated, cherished mainly in Downtown circles, as well as by visitors to the Mattress Factory. Of course, Lankton’s name has become more recognizable in recent years due to Participant Inc.’s 2014 retrospective LOVE ME, which did the necessary work of introducing Lankton’s work to a new generation and audience. 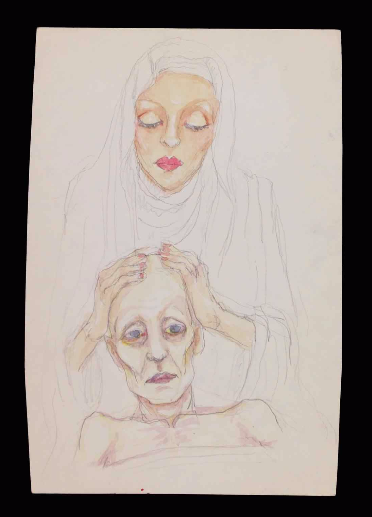 Despite emerging as an essential figure for both art making and trans visibility, Lankton still remains a bit of a mystery–her interests and obsessions mainly on display in her work itself as seen in It’s All About ME, Not You, with her tributes to Candy Darling, Patti Smith and a large sickly doll covered in pills. 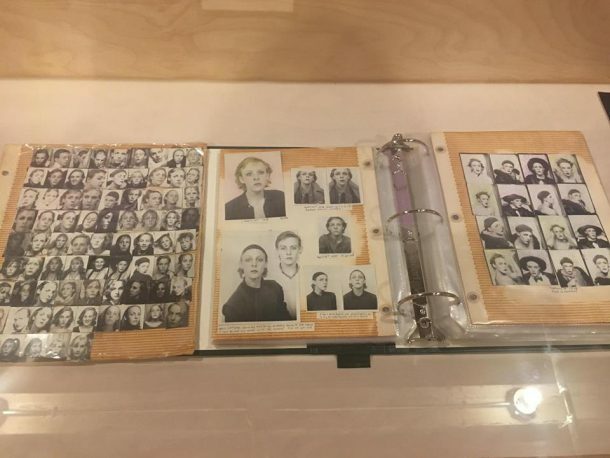 In addition to ferreting out details about Lankton through her art, as well as chatting to her friends and former colleagues in the East Village art scene, her archives (like many archives) stand in the place of written, documented history. As Kaye Mitchell writes in their critical “That Library of Uncatalogued Pleasures: Queerness, Desire and the Archive in Contemporary Gay Fiction,” “Queer archives have been concerned both with the (defiant) creation of a public culture and with the safeguarding and validation of private cultures and lives.” In many ways, Lankton’s archive does both: it provides essential traces of the artist’s all-too-short life, as well as details her prolific creative drive. At the same time, the archive publicly affirms the life of a trans woman artist. With their androgynous angularity and skeletal frames, Lankton’s works on paper are reminiscent of Egon Schiele’s subjects, as well as the artist herself (who struggled with anorexia and drug addiction throughout her life). Like her dolls, the drawings, on view in the Mattress Factory, often deal with gender and gender performativity. 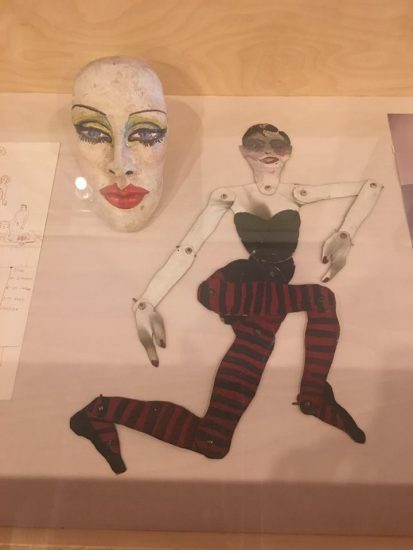 Many of the drawings feature glamorous trans or gender non-conforming figures while, others zero in on highly detailed renderings of genitalia. 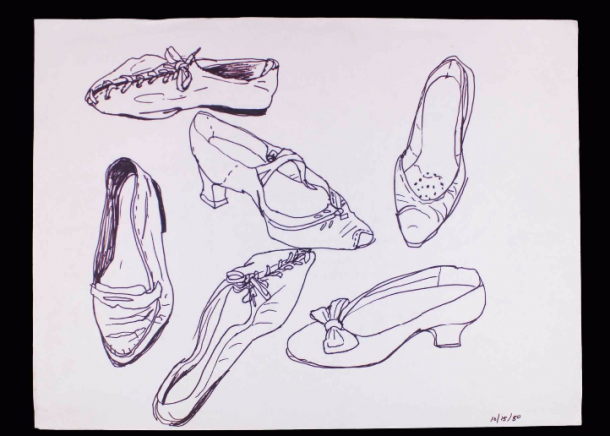 Other drawings take aim at the materiality of femininity like a collection of high-heeled shoes that echo Warhol’s early shoe advertisements from the 1950s. 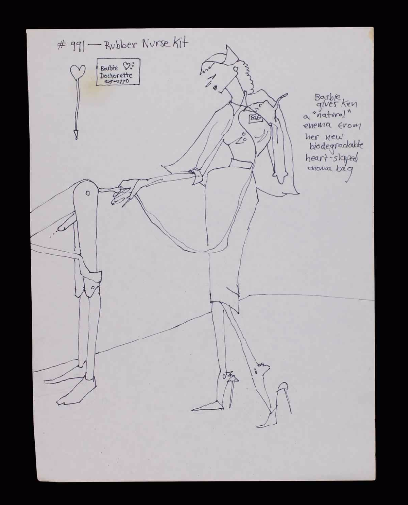 Another drawing showcases a more sexually experimental Barbie who “gives Ken a ‘natural’ enema from her new biodegradable heart-shaped enema bag.” Sporting similarities to a set of hypersexual Barbie sketches by Ellen Cantor, exhibited last year at 80 Washington Square East Galleries, Lankton converts the quintessentially feminine Barbie into her own subversive plaything. In addition to the works on paper, the ephemeral materials contained in two vitrines place Lankton firmly within the East Village artistic community of the 1980s and 1990s, recording her participation in major social events of the era. For example, in a datebook from September 1990, Lankton highlights the date of Wigstock by rendering a sketch of the unmistakable Lady Bunny in her giant platinum bouffant. 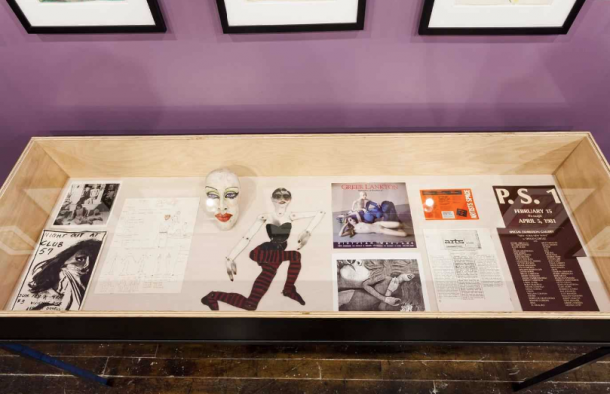 Another vitrine features flyers from events featuring Lankton at Club 57, as well as an invite for New York/New Wave at PS1, a seminal exhibition curated by Diego Cortez which introduced many on the East Village scene to the wider art world. Particularly for trans and gender non-conforming folks, traditional historical documentation has been insufficient at best. This accounts for the needed turn toward inconspicuous and unusual traces as seen in Lankton’s note, which could easily have been tossed-away. As Aaron H. Devor and Lara Wilson write in “Putting Trans* History on the Shelves: The Transgender Archives at the University of Victoria, Canada,” published in Out Of The Closet, Into The Archives: Researching Sexual Histories, “Trans* people need to know their past, both as it intertwines with the histories of gay, lesbian, bisexual and queer people, and also as it is distinct from these histories. People who today might be known as trans, have always been present in lesbian and gay life. However, their presence and contributions have not always been fully understood, acknowledged or appreciated” (255-256). 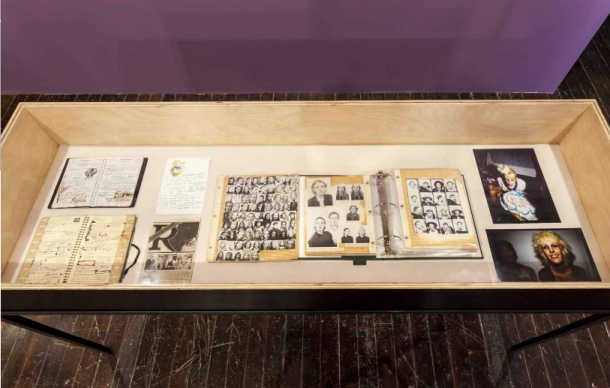 For queer people, history is still incomplete with archives like Lankton’s filling in the gaps with records their lived experience. And for people with identities that are still threatened by a phobic society even with increased visibility, this is crucial. As Devor and Wilson assert, “Knowing one’s history is essential to having a clearly formed identity. One can learn the history of one’s people in many ways, not the least of which is through examining material records of the past. Archives are an indispensable way for people to learn their heritage, by providing accounts of past facts, acts and events” (255). They go on to quote the “universal declaration on Archives,” issued in 2010 by the International Council on Archives and adopted in 2011 by UNESCO: “Archives record decisions, actions and memories. Archives are a unique and irreplaceable heritage passed from one generation to another…They are authoritative sources of information…[that] play an essential role in the development of societies by safeguarding and contributing to individual and community memory. Open access to archives enriches our knowledge of human society, promotes democracy, protects citizens’ rights and enhances the quality of life.’” (255). 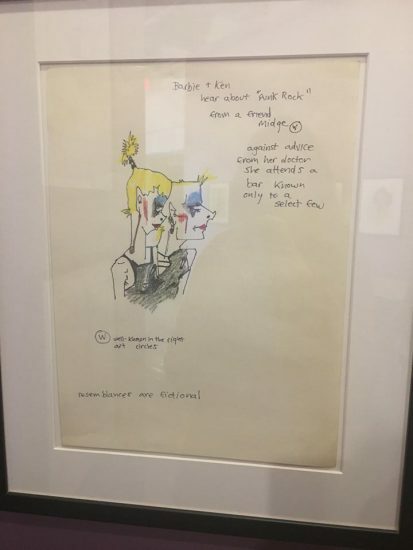 Tags: Aaron H. Devor and Lara Wilson, Alexandra Juhasz, Ann Cvetkovich, Barbie, Club 57, David Bowie, dolls, East Village, Greer Lankton, Jack Halberstam, Mattress Factory, New York/New Wave, Pittsburgh, queer archives, Selections from the Greer Lankton Archive. Bookmark the permalink.